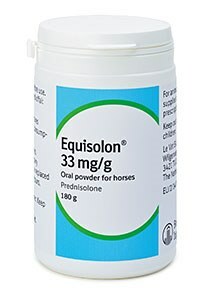 Boehringer Ingelheim Vetmedica has launched Equisolon 33 mg/g oral powder, the first licensed oral prednisolone for the alleviation of inflammation associated with recurrent airway obstruction (RAO), otherwise known as heaves, in horses. Clare Turnbull, equine brand and technical manager at Boehringer Ingelheim Vetmedica said: "Oral glucocorticoids are sometimes necessary for treating the inflammation associated with RAO. We feel it is important that when our customers need to use prednisolone for their cases, there is an equine specific product available to them that is easy to dispense and administer." The company says Equisolon should be used in combination with environmental measures to treat RAO. For further information on Equisolon, contact your Boehringer Ingelheim Vetmedica equine representative or call +44 (0)1344 746959.